For the month of April, our charity collection will be dedicated to St. George Community Support Fund. For the rest of this month, our charity collection will be dedicated to the OCMC. This month, our Charity Collection will be used to toward the St. George Community Support Fund. A separate fund is being established and set aside to help members of our community in times of need. Please be generous. This month, our Charity Collection will be used to benefit The Spooner House. This month, our Charity Collection will be used to benefit the Trumbull Food Pantry. This month, our Charity Collection will be used to benefit the family of Ruben Rodriguez who died in a tragic accident. He is the step father of Eddie Medero and the father-in-law of Amanda (Broadus) Medero. The collected funds will go toward funeral expenses. This month, our Charity Collection will be used to benefit Trumbull Helps. This organization makes meals for The Bridgeport Rescue Mission, The home of the Brave, and for seniors in Trumbull. They also supply meals to individuals in time of need. This month, our Charity Collection will be used to benefit the Bridgeport Rescue Mission. This month, our Charity Collection will be used to benefit the Red Cross in Korça Albania. This month, our Charity Collection will be used to purchase the Juice Boxes we are collecting for Trumbull Helps and the Bridgeport Rescue Mission’s Summer Breakfast and Lunch program. This month, our Charity Collection will help support the Orthodox Christian Mission Center (OCMC), supporting Timothy Halvorsen’s mission trip to Albania. This month, our Charity Collection will help support Trumbull Food Pantry, an organization that assist needy people in our area. This month, our Charity Collection will help support Bridgeport Rescue Mission, an organization that assist needy people in our area. This month, our Charity Collection will help support Spooner House, an organization in Shelton that assist needy people in our area. This month, our Charity Collection will be sent to the Hockey Has Heart organization in Detroit, Michigan, which is collecting money to help Fr. Dimitrie Vincent, Pastor of our St. Thomas Church in Detroit, in his recovery from a spinal cord injury. This month, our Charity Collection will benefit the Trumbull Food Pantry, which assists needy persons in our area. This month, the month of Thanksgiving Day, our Charity Collection will benefit the Bridgeport Rescue Mission, which assists needy persons in our area. This month we are supporting the Theological Student Fund of our Albanian Archdiocese. This Fund supports young men from our Archdiocese who are studying for the Priesthood as well as clergy and others who are travelling to Albania to support the Church there. Our September Charity Tray will support the International Orthodox Christian Charities efforts to support victims of the flooding devastation in Houston, TX from Hurricane Harvey. This month, our Charity Collection will help support the Spooner House. Trumbull Helps will be assembling 700 summer lunches for the Bridgeport Rescue Mission. We at St. George will be collecting juice boxes for them starting until August 19th. There will be a box in the Church vestibule. Thank you in advance for helping to feed children who need us. This month, our Charity Collection will help support the Trumbull Food Pantry. In June of 2017, our Charity Collection will help support UNICEF’s famine relief work in Somalia. This month, our Charity Collection will help support the CROP Hunger Walk program of Church World Service that raises funds to end hunger at home and around the world. This month, our Charity Collection will help support the Trumbull Food Pantry, an organization in that assists needy people in our area. This month we are supporting LifeBridge, an organization that assists many people in our area. This month we are supporting Trumbull Helps, an organization that assists many charities and other good works in Trumbull. In December 2016 and January 2017, we are supporting the International Orthodox Christian Charities as they work to help the people of the city of Aleppo in Syria and other places around the world who have been forced from their homes. In November, we are supporting the Binky Patrol. This is an organization that makes small blankets for critically ill and traumatized children in our area. This Fund supports young men from our Archdiocese who are studying for the Priesthood as well as clergy and others who are continuing their education or who are travelling to Albania to support the Church there. This month we are again supporting the Rett Syndrome Research Trust which raises funds for research into Rett Syndrome, the disease that took Eva Karajani from us two years ago this month. This month, our Charity Collection will help support the Trumbull Food Pantry which helps needy people in our area. This month, our Charity Collection will help support the Fr. Juvenaly (Repass) who will be doing long-term missionary work in Guatemala with the Orthodox Christian Mission Center. He visited our parish at the beginning of June and spoke of his work. This month, our Charity Collection will help support the “Team Caroline and Mia,” an effort in our area to support the families of Caroline and Mia, two kindergartners at Jane Ryan School in Trumbull who are struggling with cancer. This month, our Charity Collection will help support the CROP Hunger Walk program of Church World Service. that raises funds to end hunger at home and around the world. This month, our Charity Collection will help support Lifebridge, an organization in Fairfield County that assists low-income people in our area to build bridges to greater self-sufficiency. This month, our Charity Collection will help support Zoe for Life!, an organization in Ohio that supports women in crisis pregnancies, assists Orthodox Christians in adoption, and provides Orthodox Christian educational resources for pure living. This month, December 2016, our Charity Collection will benefit the Trumbull Food Pantry, which assists needy persons in our area. For the month of November 2015, the month of Thanksgiving Day, our Charity Collection will benefit the Bridgeport Rescue Mission, which assists needy persons in our area. Our charity tray for this month will be to support Deacon Stephanos and Alexandria Ritsi's mission in Albania through the Orthodox Christian Mission Center. In September, we are again supporting the Rett Syndrome Research Trust which raises funds for research into Rett Syndrome, the disease that took Eva Karajani from us two years ago this month. During the month of August, our Charity Collection will help the Special Olympics Connecticut which provides athletic competition opportunities for physically and mentally challenged people in our area. During the month of July, our Charity Tray will help the Wounded Warrior Project which assists wounded military veterans. During the month of June, our Charity Collection will help Trumbull Food Pantry to provide assistance to people in need in our area. During the month of May, our Charity Collection will help support of International Orthodox Christian Charities, who are providing relief to the victims of the recent earthquake in Nepal. During the month of April, our Charity Collection will help support Crop Walk, an event that works to fight hunger in our communities. During the month of March, our Charity Collection will help support the family of Father Matthew Baker, who was killed in an automobile accident on March 1st, and who leaves behind a wife and 6 children. During the month of February, our Charity Collection will help support the Orthodox Christian Mission Center, or the OCMC, an organization that supports Orthodox missions around the world. During the month of January, our Charity Collection will help support Zoe for Life!, an organization in Ohio that supports women in crisis pregnancies, assists Orthodox Christians in adoption, and provides Orthodox Christian educational resources for pure living. In December, we will be supporting Spooner House, and organization in Shelton that ministers to the needy and homeless in our region. Our Charity Collection for the month of November (the month of Thanksgiving) will help support the Bridgeport Rescue Mission, which assists people in need from the Greater Bridgeport area. Our Charity Collection for the month of October will help support the Albanian Archdiocese Student Fund, which assists members and parishes of our Archdiocese with Seminary education and other projects. In September, we are collecting for the Rett Syndrome Research Trust which raises funds for research into Rett Syndrome, the disease that took Eva Karajani last September. This will be an annual collection during the month of September. In August, our collection will support Spooner House, an institution in Shelton that cares for the needy of our region. Click on the following link to learn more about the Spooner House. In July, our Charity collection will continue to support the Bridgeport Rescue Mission. Click on the following link to learn more: Bridgeport Rescue Mission. In June, our Charity Tray collection will support the Bridgeport Rescue Mission. Click on the link to learn more about the Bridgeport Rescue Misson. In May, our collection will support FOCUS North America, an Orthodox Christian organization that serves the poor and homeless around the country. In April, our collection will support the Special Olympics. We are taking a special collection today for the family of Kristjan Ndoj, the Albanian boy from Shelton who was shot and killed last week. Please be generous! In February, our Charity Collection will be used to support our Relay for Life team. Click on the attached link for learn more about the American Cancer Society's Relay for Life fund raiser. In February, our Charity Collection will be used to support Spooner House, an organization in Shelton that ministers to the needy and homeless in our area. Click Here to learn more about the Spooner House. In the early morning of Friday, January 24th, a home was destroyed by fire in Bridgeport. The family’s children attend the school where Chris and Sharon Buzi teach. The whole family is safe, but they lost everything in the fire. We will take a special Charity Collection today, Sunday January 26th, to assist them. Donations can still be made to Zoe for Life for our Monthly collection. During the month of January, our Charity Collections will help support Zoe for Life!, an organization in Ohio that supports women in crisis pregnancies, assists Orthodox Christians in adoption, and provides Orthodox Christian educational resources for pure living. Click Here to go to the Zoe for Life! website. We are collecting non-perishable food for the residents of Spooner House in Shelton. There is a container by the front door of the Church where people can place their donations. During November, our Charity Collection will support the Bridgeport Rescue Mission. Click on the following link to learn more about the Bridgeport Rescue Mission. During October (continuing as we collected in September), our Charity Collection will go to Saint John the Baptist Church in South Boston to help them recover from the recent fire. During September, our Charity Collection will go to Saint John the Baptist Church in South Boston to help them recover from the recent fire. In July, our Charity Collection will support the Bridgeport Rescue Mission. The stated mission of the Bridgeport Rescue Mission is: "To fight poverty from the inside out as we embrace the urban poor and addicted with the compassion of Christ, offering hope and healing for a changed life." through a vision "To excel in the provision of food, shelter, clothing, education, job training and residential discipleship for the urban poor and addicted." In July, our Charity Collection will support the Bridgeport Rescue Mission. Please be generous! Click on the link to view more information. In June, we will be supporting the Little Flower Orphanage in Korça, Albania. For May 2013, our Charity Collection will be used to assist Nikola Tarisu, a young man recently arrived from Albania who lost all his possessions in a recent fire in Waterbury. This month, our Charity Collection will be used to support the Mission Trip of Greg Buzi II to Guatemala this summer. This month, our Charity Collection will be used to directly support John Babich who will be participating in fund raising for the Saint Baldrick's Foundation which supports research to overcome childhood cancer. This will be my fourth year that I'll be shaving my head for St. Baldrick's in memory of my friend Teddy who lost his battle with cancer in 2010. With my bald head, I’ll stand in solidarity with kids being treated for cancer. But the real point of all this is to raise money for life-saving research. I’m doing it for infants, children, teens and young adults fighting cancer. While it’s especially hard to think of kids fighting cancer, I’m also glad to know that some of the research supported by this foundation ultimately helps to fight all cancers. Please consider making a donation and supporting my efforts to raise money for this important research. I can assure you this gift will be used responsibly. The St. Baldrick’s Foundation is the largest private funder of childhood cancer research grants. This is a volunteer-driven charity, which keeps fundraising costs low and grants high. In 2012 alone, St. Baldrick’s granted more than $23 million for research – almost all raised by more than 31,000 “shavees” like me, from people like you! This is a fun way to do something very important. Thank you for your support! If you wish to directly support him through St Baldrick's , please go to the website to donate under his event. You can find his event listing Under Donate, type in John Babich under the "I'm donating under the fundraising goal of" . You should see: John B., Fairfield CT, March 7, 2013, Stratfield Elementary School, TeamBrent, Team Teddy. The monthly Charity Tray for February 2013 will be to support the Trumbull Food Pantry. This month, our Charity Collection will be donated to International Orthodox Christian Charities (IOCC) to be used for relief from tropical storm Sandy in our area. Click Here for more information on the IOCC efforts. The December Charity Tray was changed during the month to support the families of the Newtown shooting tragedy. In November, our Charity Collection will support Spooner House, an institution in Shelton that helps the poor and homeless. Additionally, on October 30, 2012, Cheryl Themel, Joann Soter, Greg Buzi, Sr., Kim O’Brien, Greg Buzi, Jr. and Laura Chadwick helped to prepare and serve dinner at the Spooner House. We thank them for their efforts. Click Here to go to the Spooner House website. In October, our Charity Collection will be used to help Bridgeport Police Sergeant Jessica Tillson, recently diagnosed with stage-4 breast cancer and mother of a 10-year old girl. In September, our Charity Collection will benefit the Bridgeport Rescue Mission. The Bridgeport Rescue Mission is a non-profit, faith-based organization committed to providing food, shelter, clothing, education, job training, and residential discipleship for the urban poor and addicted. In August, our Charity Collection will support the Special Olympics. Our charity collection for July will support Orthodox New England (ONE) Stewards, particularly benefiting the New England Youth Rally. In June, our Charity Collection will be used to support the American Cancer Society Relay for Life effort. In May, we will be collecting to help a priest and parish in Nanticoke, PA, where the rectory burned down in a Sunday morning fire. During April, our Charity Collection will support the mission trip to Kenya of Matushka Suzanne Aleandro and her husband, Fr. Vladimir Aleandro. During March, our Charity Collection will be used to support International Orthodox Christian Charities (IOCC) and the work they do in this country and around the world helping people in need. Click Here to go to the IOCC website. During February, our Charity Collection will be used to sponsor John Babich’s participation in the St. Baldrick’s Foundation “Head-Shaving” event to support research to end childhood cancer. If you would like to support John individually, go to www.stbaldricks.org, click on “Find a Participant” and enter his name in the fields to the left of the page. Then click on the “Donate” button at the right to make your donation. Click here to learn more about St. Baldrick's. During the month of December, our Charity Collections will help support Fisher House, an organization that provides a “Home away from Home” for wounded veterans and their families at VA hospitals around the country. During the month of September, our Charity Collections will help support the development of the National September 11 Memorial and Museum at Ground Zero in New York City. In August, we will be supporting the Wounded Warrior Project, which is dedicated to helping injured military service members. During the month of July, our Charity Collections will help support Bread of Heaven Ministry, Inc., an outreach to the homeless, needy and hurting in the city of Bridgeport. During the month of June, our Charity Collections will go to the International Orthodox Christian Charities (IOCC) for the support and assistance of those suffering from the recent tornadoes in the Mid-west. Click Here to view the IOCC web page discussing the tornado relief effort. In May, our collection will help to support the Monroe Food Pantry. In April, our collection will help to support a program of the Capitol Regional Education Center in Hartford. They are making arrangements for 5 students of the Jani Vreto School in Leskovik, Albania, to spend a week at the Metropolitan Learning Center for International Studies, a magnet school in Hartford. This Sunday and next, March 20th and 27th, at the request of the Holy Synod of Bishops of the Orthodox Church in America, our Charity Collections will go to the International Orthodox Christian Charities (IOCC) to assist in its relief efforts in Japan. Please be generous! In March, our Charity Collection will go to support the Monroe Food Pantry. In February, our Charity Collection will go to the International Orthodox Christian Charities (IOCC) to help the people of Haiti who are still suffering a whole year after the earthquake that desolated their country. In the last 12 months, the IOCC has assisted over 200,000 people in Haiti, however continued support is required. In January, our Charity Collections will be used to support Thomas Merton Center, an agency in Bridgeport that helps people of every age group and nationality who are in need. During November and December, our monthly Charity Collection will support Chancery renovations for our Albanian Archdiocese. We are hoping to conduct a “Walk for Water” to help the Orthodox Christian people of the Turkana tribe in northern Kenya have access to clean water. The money raised through this walk will help to construct bore holes in a few villages in the region. Be on the lookout for details. During the month of October, the Charity Collection has been designated to support this effort. Michel Baik and Steven Velazquez, two firefighters, lost their lives last week in the line of duty. Our sympathies and prayers go out to their families. Michel was a parishioner of St. Nicholas Orthodox Church on Park Avenue in Bridgeport. He is survived by his wife, Laurie, and children Andrew, Thomas, and Margaret. This month’s charity collection is for the children of Michel Baik. Our charity collections for the months of June and July will be for the Sisters of Mercy. Diana Breaz is the six year old daughter of Simion and Violeta Breaz of St. Dimitrie’s Church. She is currently undergoing treatment for brain cancer. The traditional treatment is dangerous for her and not very promising, so her parents have been seeking alternative treatments. This is very expensive and not covered by medical insurance. On February 14th, the St. Dimitrie’s community initiated a project to raise money for Diana. The St. George community wishes to assist them with their efforts by dedicating our May charity tray to Diana. Please keep Diana and her family in your prayers. All proceeds collected during April will go to the Bridgeport Rescue Mission which help the hungry, homeless, and addicted throughout Fairfield County. Click Here to go to the Bridgeport Rescue Mission website. The March Charity Tray is to assist Fr. Gregory Becker who recently lost all of his possessions when a fire broke out in his home on February 26th. Father Gregory is servicing St. Elia Orthodox Church in Jamestown, NY. St. Elia is a sister parish in the Albanian Archdiocese of the OCA. On behalf of the archdiocese, we are raising money to assist him in his loss. We will be collecting the last three Sundays of January to support Haiti. By now we all have seen pictures of the incomprehensible destruction and loss of life in Haiti who are the poorest of the poor. Not everyone is in a position to donate to emergency relief, but if you are, please be encouraged to do so. Father Vladimir Aleandro from Christ the Savior Church in Southbury and his wife Suzanne will be returning to Africa in February 2010 to continue their missionary work. This time they will venture into the most remote, isolated and dangerous area in Africa. We are dedicating the December and January Charity Tray to assist their effort to spread the Word of the Lord among people who have never been exposed to Christianity. 21.6% of Bridgeport’s residents live below the federal poverty level; every day, men, women and children receive a hand up and out of their circumstances through the programs and services at Bridgeport Rescue Mission. Beyond money, these food items are needed for distribution: cans of vegetables, fruits or soups; pasta, pasta sauces, macaroni & cheese, hot/cold cereal. As part of an archdiocese wide appeal, monies from the October Monthly Charity Tray will be used to purchase and deliver Christmas stocking of toys and sweets to needy children in Albania. The monthly collection for August and September will be to provide financial support to the Archdiocesan Seminarian Fund. The donations will be turned over to the Archdiocese at the Archdiocesan Assembly which will be held in Philadelphia on September 24th-26th. The monthly Charity collection for both June and July is to provide financial support for the Church Planting Grant Appeal (formally known as the “Mission Appeal”) which supports qualifying OCA missions. Click Here to view a letter from Metropolitan Jonah asking to support to the 2009 Church Planting Grant Appeal. Metropolitan Jonah invites all OCA parishes to support FOCUS North America. FOCUS North America is a network of Orthodox Christian social action ministries that express Christ's love in North America for those who are hungry, thirsty, strangers, naked, sick or in prison [Matt. 25:35ff]. "While many of us live in relative comfort, the reality is that many in our country and even in some of our parishes are facing desperation," Metropolitan Jonah writes in his letter. "I know that you are already supporting your parish and other worthy causes, but I hope that, out of the abundance that the Lord has given you and according to your means, you will also support this important initiative." The monthly Charity collection for April is to provide financial support for the Saint Innocent Orphanage and Project Mexico. These charities state their mission as "Building hope for boys without families and families without homes"
The Church School is sponsoring a food collection as a Lenten Outreach program. The specific program being supported is called the "Week-ender Backpack Program" which helps children in the Greater Bridgeport area who do not have enough food to last them through the weekend. This is a very exciting time for many VA Connecticut veterans who have been homeless. Soon they will be moving into their own apartments. Furniture in good (lightly used) condition and household items are needed to make these apartments a home. If you have items to donate please call Jennifer DeGaetano at the Errera Community Care Center at (203) 500-5613. Charity collections for March 2009 are to provide financial support for Orthodox missions through the Orthodox Christian Missionary Center (OCMC). The OCMC is the official international missions agency of the Standing Conference of Canonical Orthodox Bishops in America (SCOBA). If you wish, you may alternately contribute by using the OCMC canisters which are available in the church vestibule. As part of his Talented and Gifted (TAG) program, TJ Coughlin was to create a Service Learning Project. As his topic, he chose one that dealt with helping those less fortunate deal with heating their homes in the winter. Following research and interviews, he developed a “Power Point” presentation and an informational/educational brochure for the parish and after a Liturgy presented his project to the parishioners. Following his presentation on February 1st, he invited everyone to a coffee hour that he sponsored – and even baked for! The support of this project will be the February Charity Tray. Click Here to view TJ's presentation materials. Click Here to go to the Photo Archive and view additional photos of TJ addressing the parish and explaining his project at the coffee hour he sponsored. Photo - from Left to Right: First Selectman of Monroe Tom Buzi and TJ Coughlin. Click Here to view a newspaper article from the Connecticut Post. Hunger never takes a vacation! The collection of non-perishable food stuffs is an on-going ministry in the parish. The proceeds are directed to area food banks (generally to the Trumbull Visiting Nurse Association and the Merton House of Bridgeport) for distribution to those who are in need. St. George maintains collection boxes in the church for donating non-perishable food items all year. We appreciate everyone's continued support! 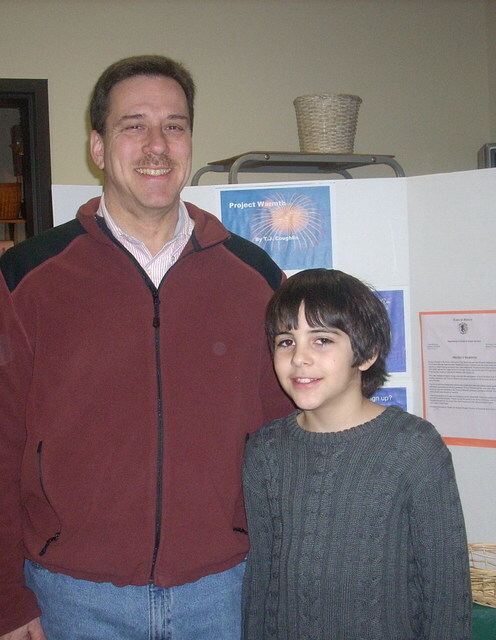 In the month of January 2009, we collected for the Thomas Merton House – a soup kitchen in the city of Bridgeport. Click Here to view a recent article about the Merton House. 2009 Real Break Greece: The project will take our parishioner to a place in Central Greece, near the city of Karditsa. This is an area rarely visited by the average tourist from abroad. However, the mountainous terrain attracts the few, who seek hard enough, to find areas unspoiled by a deluge of tourists. The team will be based in the sixteenth century monastery of the Twelve Apostles, known by the locals as “Red Church,” just outside of Karditsa. The Twelve Apostles monastery works closely with Saint George Monastery near Mavromati. St. George Monastery is famous for housing one of the four icons of the Virgin Mary associated with St. Luke the Evangelist. This monastery is one of two historic monasteries in the local Diocese which have been recently reopened. The other, near the village of Katafigi, is the sixteenth century monastery, Moni Petras. Moni Petras is famous for its Wonder-working icon of the Virgin Mary. Both sisterhoods of St. George and Twelve Apostles, as well as the brotherhood of Moni Petras are international in character consisting not only of Greeks but people from various other countries such as the United States, Russia, Germany, Georgia, England, South Africa and Israel, to name a few. Most members of both monasteries speak English at least as a second language. The team will be working with all three of the monasteries on any tasks that they need our assistance. Even though this mission will be taking place during Great Lent, the hosts will do all in their means to offer genuine Greek hospitality, as well as the opportunity to participate in their daily lives of prayer and work. The monastics at these three monasteries are wonderful people. They are looking forward to the team’s arrival. They have plenty of plans to keep the participant busy, but will also make sure he/she learns and experiences Orthodoxy in a truly unique manner, one which cannot be experienced anywhere else. 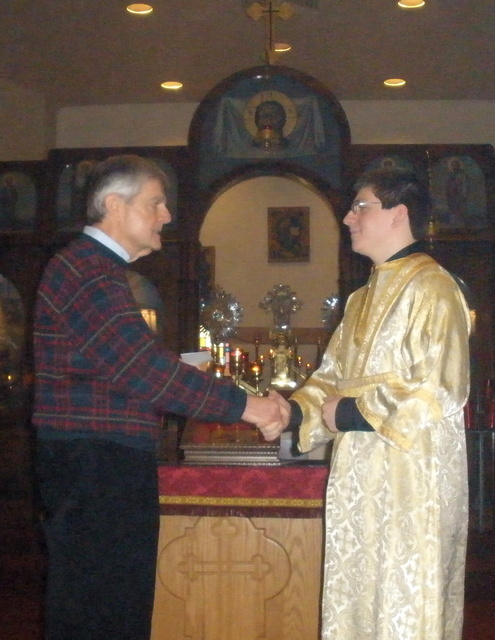 Photo - from Left to Right: Parish Council President Bill Kovachi presenting a check to Christopher Adams to help subsidize some of his travel expenses to Greece for his Real Break experience.